Four Hand-rolled, Rare, Small-Batch Cigars each month from the world's top producers using the highest quality aged tobaccos. Each shipment features four different, top-rated cigars of varying shapes, sizes, and tobacco blends, hand-crafted by extremely limited-production, boutique manufacturers, as well as cigars from super-premium brands. Our Monthly Newsletter with detailed tasting notes, cigar profiles, manufacturer histories, and suggested alcohol pairings. For the most discerning cigar lovers, we offer The Rare Cigar Club. Each shipment features four different and extremely limited-production hand-rolled cigars. Made with the highest quality aged tobaccos and typically boasting retail values between $12-$25 per cigar, The Rare Cigar Club is the ultimate cigar experience for when only the best will do! These small-batch cigars are selected from boutique manufacturers like Alec Bradley and Carlos Toraño, as well as highly-rated super-premium brands like Graycliff, Macanudo and Cohiba. Members always get a variety of lengths, gauges, wrapper types, and tobacco blends. Every shipment includes our monthly newsletter with tasting notes, cigar maker profiles, tobacco blend specifications, drink pairing recommendations, and more. Plus, each shipment is carefully packed with a reusable humidification device to ensure optimal humidity while your cigars are in transit and after they reach you. Sourcing Cigars – On Location! Each year, our 9-member panel of tobacconists collectively spends nearly half a year in man hours in Honduras, Nicaragua, and the Dominican Republic working with manufacturers to refine new blends. They sample over 12,000 cigars per year and review each for appearance, aroma & flavor, draw and construction – ensuring only well-made, superior cigars are selected for the club. Found some cigars you just have to have more of? No problem! Members enjoy discounted pricing on 5-packs and full boxes of their favorite featured cigars. Each of our nine cigar panel members offers unique experience in the tobacco industry, from growing, processing and aging tobacco to working directly with manufacturers to create exclusive blends. Rest assured, we’re knowledgeable and passionate about cigars and we’ve got your back. Our panel fires up over 200 cigars a week rating each for proper construction, appearance, aroma, smoke volume and overall impression and flavor profile. We make sure each consistently burns right and has a proper draw. We smoke a lot of bitter, harsh, improperly aged and poorly constructed cigars (not to the nub mind you) so you don’t have to! Less than 5% of those considered ever make it to you. Our guys spend nearly 6 months in man hours every year visiting top cigar producers in Nicaragua, Honduras and Dominican Republic. They’re touring production facilities, working with producers to test and refine blends, inspecting final products, and most importantly in Central and South America, building relationships. Over the years, our panel members have collectively visited every cigar manufacturer in Central and South America as well as the Caribbean and have built strong, long-lasting relationships. That presents unique opportunities to be a part of creating and fine-tuning blends as well as the ability to offer our members exclusive selections such as the Diesel Grind Perfecto, a 6x60 beautifully crafted cigar available only to club members. My son got me a gift membership to your cigar club for Father's Day this year… Everything received has come in great shape. I really like the variety and trying new things! For over 20 years, we’ve been delivering boutique and limited production hand-rolled cigars, perfect as memorable gifts for experienced and novice cigar lovers alike. With a membership to one of our premium cigar clubs, your gift will be appreciated long after the first shipment arrives! It’s Not Just Cigars – It’s a Cigar Experience! Our goal is to make each cigar club gift membership a true “experience” gift. 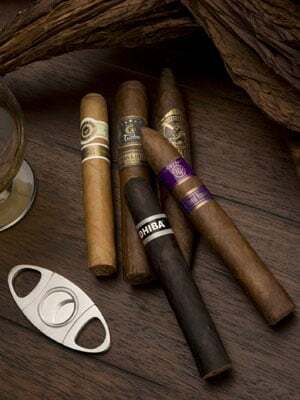 Recipients enjoy premium hand-rolled cigars curated by our 9-member professional tasting panel, plus: cigar maker profiles, tobacco blend info, cigar shape & size specifications, detailed tasting notes and panel ratings, recommended drink pairings, and more. Exploring the large and ever-evolving world of fine cigars with our members has been our passion for over 20 years, and we can’t wait to share the fun of uncovering great new cigars with your gift recipients in the months to come! During checkout, you’ll have the option to schedule an email gift announcement for any date you choose, or create a PDF that you can print out and give to your gift recipient. It’s the perfect solution for those of you who are in panic mode! Just order your cigar club gift membership to start with the next available shipment, and email or print a gift announcement today!